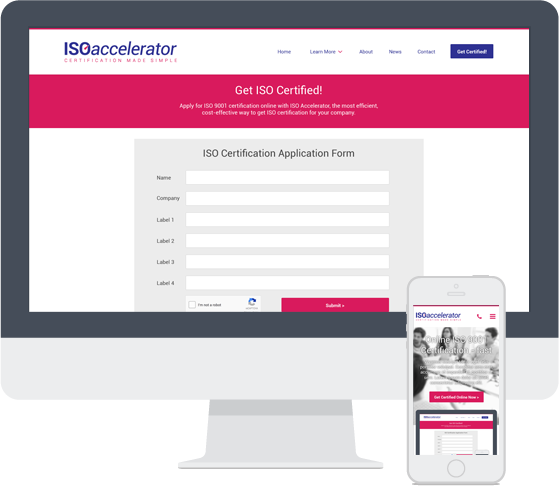 ISO Accelerator is a speedy, cost-effective way to get ISO 9001 certification online. Use the USAS accredited Self certification process and get your business certified now! Obtaining ISO certification is a great way to demonstrate that you are running a high-quality, customer-focused business that’s a cut above the competition. However, the ISO 9001 accreditation process can be costly, time-consuming, and labour-intensive, and many company owners feel that they simply don’t have the resources for it. ISO9001:2015 is an international standard, which means that both national and international accredited certification bodies are able to offer ISO certification. The USAS-accredited ISO certification process is one of the UK's best kept ISO certification secrets. It allows British businesses to get certified online through an American body. This dispels any myth that only accredited certification bodies based in the United Kingdom can offer accreditation services. The phrase ‘international standard’ really does mean international! Using up-to-date communication methods, USAS have developed an online process for ISO certification that enables certification bodies such as ISO Accelerator to offer accredited ISO certification online. Online certification can save you money in a number of different ways, most notably by removing the need for a 3rd party auditor to visit your facility. Our service also allows you to get certified faster than usual. So why wait to achieve ISO 9001 certification for your business? How does ISO Accelerator work? Next, you will be issued with a Self-Declaration of Conformance, which states that you have implemented the Quality Management System Manual. Once we have received your Declaration of Conformance, we will issue your ISO 9001 certificate (valid for 3 years). You will need to self-certify on an annual basis to maintain certification. ISO Accelerator is accredited certification by body that is authorised by USAS to certify companies against the requirements of ISO9001.